Independent films rarely take on science-fiction. Reason is because sci-fi films usually require lots of money for sets and effects. On the other hand, having angsty conversations about your family is relatively cheap. When the genre is tackled, I have often enjoyed the results mostly because they tend to be deconstructions or re-imaginings of the sci-fi tropes and the films I've seen before. That is exactly what Another Earth is. The duo who wrote the film are the director and the main star, Mike Cahill and Brit Marling. In this film, they wrote up an amalgamation of two significantly individual films that, at times, were smashed together to good effect. Rhoda Williams (Brit Marling) is a bright young woman accepted into MIT's astrophysics program. She aspires to explore the cosmos. A brilliant composer, John Burroughs (William Mapother – Ethan from "Lost"), has just reached the pinnacle of his profession and is about to have a second child. On the eve of the amazing discovery of another world with the same bodies of water, continents, people, history, and in all ways, a perfect duplicate of our own planet, tragedy strikes and the lives of these strangers become irrevocably intertwined. When the identical planet, called Earth 2, first appears in the night sky it is a small blue speck. Four years later, Earth 2 appears on the horizon as a bigger sphere then the moon which would not only mean that in the next few months the two planets would collide but also that there would be so much havoc being wreaked upon our earth - tidal waves, shifting poles - that we would be cursing Earth 2 rather then trying to contact it. So you can kind of see that physics is definitely played with fast and loose. This movie is as sci-fi as Back to the Future; in other words, it's just a plot point. All fiction and no science. That said, it is a new way to do the overly trodden alternate dimension / alternate timeline story and for that I give it a few brownie points. The second part of the story is something akin to Terry Gilliam's The Fisher King or Alejandro Inarritu's 21 Grams where guilt leads a character to reach out to someone they feel they owe something to. Both of those comparisons are weak though and the way the shame and sorrow storyline is woven into the Earth 2 storyline – "I wonder if my life is as jacked up on Earth 2 as it is here." – took it all in a new direction and explored new ideas which I enjoyed. The two main actors, Brit and William, were fearless and flawless in bringing the depression their characters were feeling to the forefront and not holding anything back. The only thing they never sold me on was the romance that was supposed to have been blossoming between them. It never felt like they should be lovers; it felt like they should have remained good friends in their strange, psychotic and entirely messed up relationship. Director Cahill will be someone I expect to see great things from. He intros this film in a way that reminded me of the way Aronofsky introed his own debut, Pi - loud and abrasive and draws you right into the story, no questions asked. Cahill is minimalistic in his dialogue, often letting the visuals speak for themselves for long stretches of the film. Sometimes this makes his characters feel like observers in a world that is no longer their own, sometimes it makes them distant to the audience. It's good that he has such confidence in his composition and cinematographer, whose itchy zoom-lens trigger finger needs to be controlled, but it will be interesting to see if he continues the understated style he's pursuing here. I also want to praise Fall on Your Sword, the band responsible for this film's score. It was brilliant and perfectly sweet and nasty and gritty. All this said, I spent most of the film thinking, "Where in the blue blazes have I seen this story before?" not only because it felt like a retread as I've stated but also because it felt familiar, like an old friend you haven't seen for years. They look familiar, but they've changed and you can't quite place where you know them from. When the light bulb finally comes on, all the memories flood back and you can sit down with them and see the path they've taken that has brought them to you again. 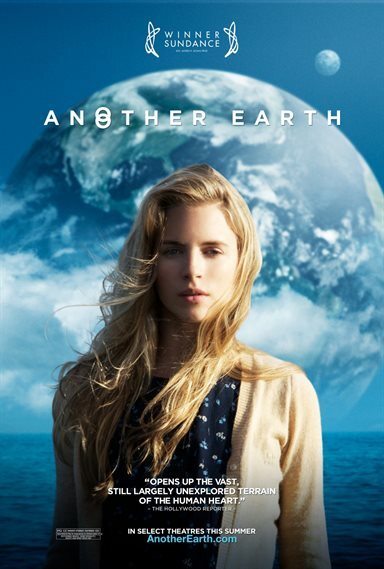 Download Another Earth from the iTunes Store in Digial HD. For more information about Another Earth visit the FlickDirect Movie Database.